We are delighted to confirm that we have been appointed as project manager, quantity surveyor and employer’s agent for online beauty and wellbeing giant The Hut Group’s (THG) mammoth new headquarters. 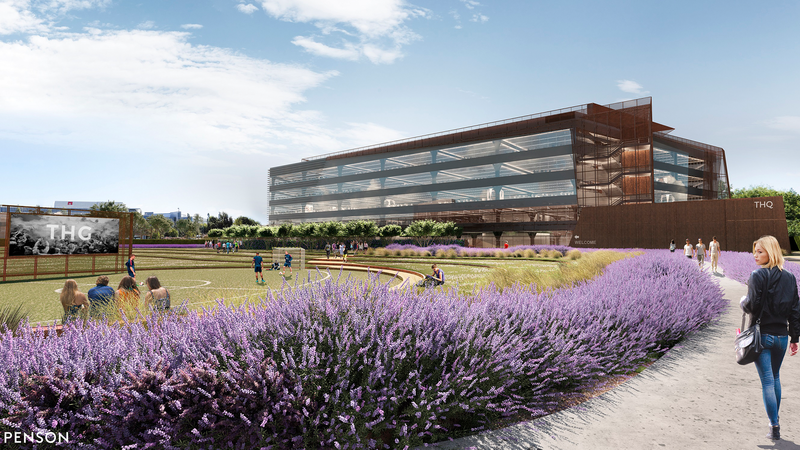 Located at Manchester Airport City, it will be the UK’s biggest bespoke office development outside of London. Phase one is expected to begin early next year and will comprise 280,000 sq ft of state-of-the-art office space to accommodate up to 10,000 employees.The interior of THQ has been designed with an integrated approach across the architecture, landscape, interior design, culture and workplace strategy, in order to create an enticing and visually striking work environment for the business’ UK-based workforce. Jamie Crouch, director at Edmond Shipway responsible for the scheme, said: “The development of THQ represents a major investment in the North West and will inevitably provide a huge boost to Airport City Manchester. I am delighted that Edmond Shipway’s performance on projects like THG’s Omega Distribution Warehouse, its production facility in Warrington and its European distribution hub in Poland has resulted in another appointment for this incredibly exciting international brand”.